Drum Tales: The Lion King of Africa | Musical IQ - Inspiring, Creative, Unifying & Fun! Drum Tales is a live and interactive musical program for children. Set in the vast majestic plains of Africa, this program resembles the traditional drum-circle, combining storytelling, musical instrumentation, and song. Each participant is given an African drum, which becomes their medium of transportation as we rhythmically traverse through the royal territory of the Lion King of Africa. Wild animals, a rolling African thunderstorm, deserts and jungles, make this an unforgettable experience. The program takes a close look at the musical instruments of Africa and the beautiful musical cultures of the African continent. 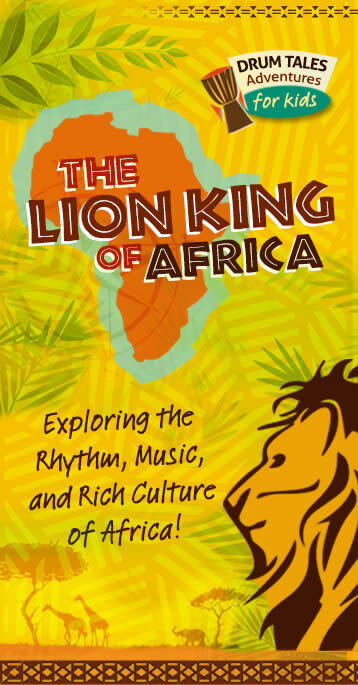 Using musical and rhythmic innovations, the story comes to life, allowing the children to experience the characters and ideas of the narrative first-hand, including the mighty roarrrr… of the Lion King himself. Through an engaging, hands-on and interactive rapport, the facilitators guide the group, step by step, through a fun and insightful journey. On the way, participants will learn the basics behind the African Djembe drum and take away the skills to make some of their own music and rhythms.